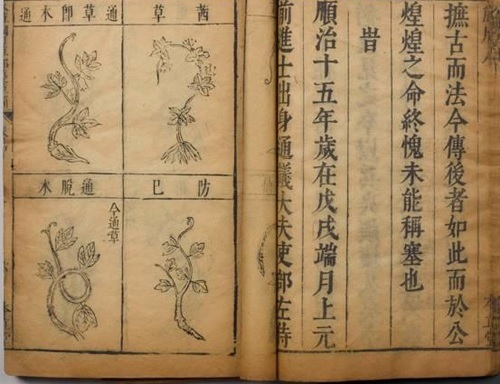 Compendium of Materia Medica (Pinyin: Bencao Gangmu) is a Chinese medicine work written by Li Shizhen (1518-1593) in the Ming Dynasty (1368-1644). It is regarded as the most complete and comprehensive medical book ever written in the history of TCM, as well as the one contributing the most to the pharmacy in the Ming Dynasty. Composed of 52 volumes with over 1.9 million characters, the book includes 1,892 kinds of medicaments, 11,096 pieces of prescriptions and 1,160 illustrations. It lists all the plants, minerals, and other items that were believed to have medicinal properties. Based on the previous achievements on materia medica, Li completed and published the book in 1590 after conducting researches of 800 other medical reference books and carrying out field study for a few dozens of years. The book corrected many mistakes and misapprehensions of the nature of herbs and diseases, improved the classification of how traditional medicine was compiled and formatted, mentioned the ideas of advanced biology evolution, and reflected the rich experience of clinical practices. 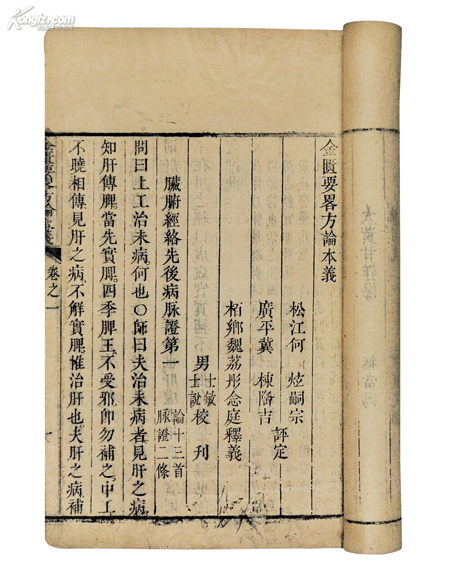 Prescriptions from the Golden Cabinet or Synopsis of Prescriptions of the Golden Chamber (Pinyin: Jin Kui Yao Lue) is the earliest monograph on the diagnosis and treatment of miscellaneous diseases in Chinese history, as well as one of the classics of TCM. The text was written by Zhang Zhongjing in the early 3th century at the end of the Eastern Han Dynasty. The book was actually compiled by later generations from his original works Treatise on Cold Diseases and Miscellaneous Diseases (Pinyin: Shang Han Za Bing Lun). The other book compiled from the same works is called Treatise on Cold Damage Disorders (Pinyin: Shang Han Lun). The book is divided into three volumes and 25 chapters: The first volume tells of the way to differentiate variants of the cold; the second volume discusses the details of miscellaneous illnesses; and the third volume describes the prescriptions and ways of treatment. 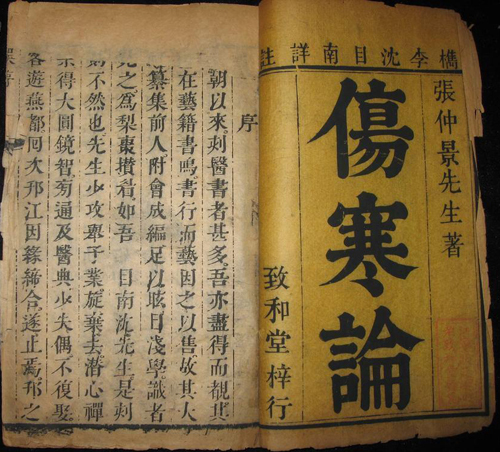 Later in the Northern Song Dynasty, the book was recompiled, with 262 pieces of prescriptions and more than 60 diseases listed in 25 chapters, mainly covering the internal miscellaneous illnesses as well as some external diseases and gynecological and obstetric diseases. Treatise on Cold Damage Disorders or Treatise on Cold Injury Treatise on Cold Damage Disorders (Pinyin: Shang Han Lun) is a Chinese medical treatise describing the treatment of the common cold, its variants and related complications. It was written by Zhang Zhongjing at the end of the Eastern Han Dynasty between 200 and 205. The book was actually compiled by later generations from his original works Treatise on Cold Diseases and Miscellaneous Diseases (Pinyin: Shang Han Za Bing Lun). The other book compiled from the same works is called Prescriptions from the Golden Cabinet (Pinyin: Jin Kui Yao Lue).Treatise on Cold Damage Disorders is the oldest clinical textbook in the world, and one of the four canonical works that the TCM-majored students must study. Composed of 12 volumes and 22 pieces, the book has 397 sections with 112 herbal prescriptions. It organizes all the diseases into the six divisions called "six channels," based on the ways treatment can be applied accordingly. Shennong's Herbal (Pinyin: Shennong Ben Cao Jing) is considered to be the earliest pharmacopoeia in Chinese history. Being the first systematic summary of Chinese medical herbs, it was completed during the Eastern Han Dynasty (25-220) by a number of medical specialists in the Qin and Han dynasties based on their experiences and achievements on pharmaceutics. The title of the works borrowed the name of Shennong, who was a mythical Chinese emperor and was said to have tasted hundreds of herbs to test their medical effect. The works are divided into three volumes containing 365 entries on medicaments and their descriptions derived from 252 kinds of plants, 67 kinds of animals and 46 kinds of minerals. The medicaments are rated with three grades: top, medium and lower. It is a compilation of all the medicaments knowledge in China before the Han Dynasty. In the book, four energies (rise, down, float and sink) and five flavors (spicy, sweet, sour, bitter and salty) are used to describe the performances and functions of the herbs. It also provides the methodology of the compatibility, processing and storage of medicines and other related issues. 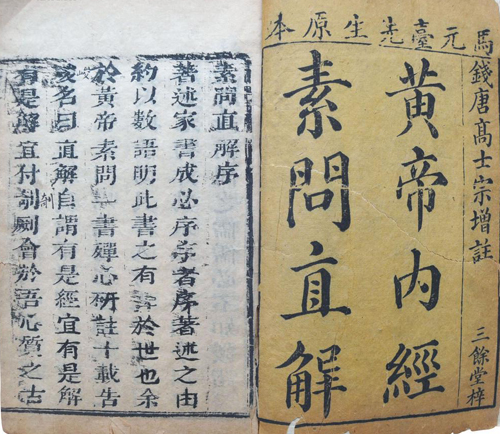 The Yellow Emperor's Classic of Medicine (Pinyin: Huangdi Neijing) is the earliest existing works on the theories of TCM that has been regarded as the source doctrinal for Chinese medicine for more than two millennia. The works are composed of two texts each consisted of nine volumes, or eighty-one chapters, in a question-and-answer format between the mythical Huangdi (Yellow Emperor) and a few of his equally legendary ministers. The first text, Basic Questions (Pinyin: Suwen) covers the theoretical foundation of TCM and its diagnostic methods. The second text, Spiritual Pivot (Pinyin: Lingshu), discusses acupuncture therapy in great detail. Completed during the Spring and Autumn Period, the body of work is a systemic summary of the theories of yin-yang and the five natural elements, the adaptation of the human body to its natural surroundings, five movements and six climates, viscera and channels and collaterals, mechanism of diseases, diagnostic methods, rules of treatment and acupuncture. It covers not only medical science but also other scientific achievements of human beings in astronomy, geography, philosophy, anthropology, sociology, war strategies, mathematics and ecology, which astonishingly revealed a lot of achievements that the modern science tries to prove or is about to prove. St Neots Chinese Medical Centre is a family run Traditional Chinese Medical (TCM) Clinic since 2006. Our goal is to provide the very best service and we are always looking for ways to improve. © 2018 St Neots Chinese Medical Centre . All rights reserved | Design by UKCNTECH.